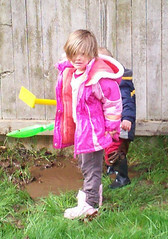 This entry was posted in blick, fun, fun, fun, kid stuff, Random. Bookmark the permalink. He’s not a happy camper. But it is kinda funny. Poetry too, huh? Your talents know no end. Knowing the two of them, I’m pretty certain the loving will follow almost immediately, so I’m not too worried. How funny is that! Not to them at this point, I’m sure. But one day far, far away, when they are all grown up those pictures will surely make them laugh out loud. Just like they made me laugh out loud sitting at my desk on a rainy Wednesday morning. 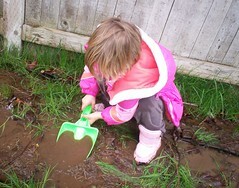 What a great mom you are to let them play in the puddles and the mud. Nothing soap and water won’t fix! Oh…you have GOT to scrapbook that one! This is just tooo good! You know, I am the same way! I love taking pictures of the kids when they are a mess. Or crying. Or bleeding. Or fighting with their brother. Or picking their nose! I can’t wait to flash those shots on the big screen slide show at their wedding! 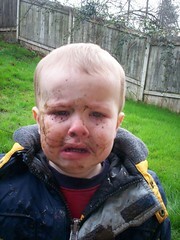 Oh my goodness… mud really doesn’t taste that good, does it? Mmmmm….love me some iambic pentameter! 😉 That was awesome, Kathryn. That picture totally rules. And your pome! Hilarious! Magoo’s face tells it all! !